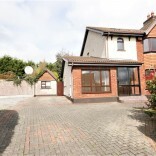 Beautifully presented 3 bedroom family home maintained in very good order throughout. 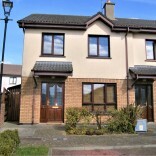 141 Fiodh Mor is located in a quiet Cul de Sac of 18 houses and has parking for 2 cars to the front and a sandstone patio to the rear Ideal for barbeques on summer evenings. Fiodh Mor is located 2.8km from Waterford city centre, this distance will reduce when the new foot bridge is constructed linking the North Quays with the city centre. 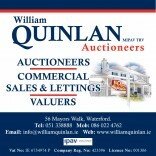 Amenities in the area include schools, a church and a number of bars and shops in nearby Ferrybank. The home is light filled with entrance hallway, main living room with bay window overlooking the front of the property, to the rear of the property is the Kitchen diner which has polished porcelain floors and extra kitchen units for ample storage. Patio doors lead to the rear garden having sandstone paving, an area laid to lawn and a timber barna shed. The property also has a guest W.C located on the ground floor. The first floor has three bedrooms all with fitted wardrobes and the master having an en-suite with triton t80 shower W.C and wash hand basin, the family bathroom has bath tub, W.C and wash hand basin. The property also has a fitted water filtration system. Entrance hallway: (4.7m x 1.9m) Open spindle staircase with fitted carpet. Living Room: (3.9m x 4.6m) Pine effect laminated floor, coal effect gas fire and bay window. Kitchen Diner: (6.0m x 3.77m) Polished porcelain floors base and wall mounted Kitchen units with extra units fitted, gas hob/oven, water filtration system. Master Bedroom: (3.9m x 3.5m) floor to ceiling build in wardrobes en-suite (1.57m x 2.6m) ceramic tiled floor W.C and wash hand basin and triton T80 shower to tiled corner shower unit. Bathroom: (2.5 x 2.4) ceramic tiled floor, clever decorative splash back tiling to bath tub, W.C and wash hand basin.